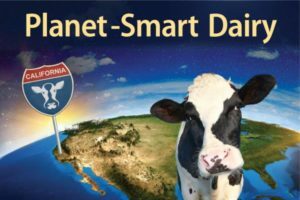 California leads the world in planet-smart dairy farming. There has been a recent surge of efforts to drastically change our dietary choices in the name of environmental protection. These efforts often share a flawed approach, citing global greenhouse gas (GHG) emission statistics, to create alarm and encourage decreased consumption of meat, dairy, and other livestock products. They falsely imply that raising livestock, no matter where or how it’s done, is bad for the planet. This simply isn’t true. As with any industry, from agriculture to transportation to manufacturing, efficiency plays an important role in delivering products we want and need, while reducing the environment impacts. A closer look at the global dairy sector shows increases in efficiency are occurring around the world, though the pace of improvements differs from region to region. California dairy farms are not only leading the way to reducing environmental impacts, but are also taking climate-smart dairy farming to a whole new level—making cows a part of the broader solution to our society’s environmental challenges, from recycling nutrients to creating renewable energy. Over the past 65 years, the United States has made significant gains in milk production efficiency, resulting in a two-thirds reduction of dairy’s overall carbon footprint. While the nation’s milk production has doubled, the number of dairy cows has decreased from 25.6 million cows in 1950 to only 9.4 million today. Attaining this same level of efficiency across all dairy regions would have a far greater impact on climate than dictating drastic changes in dietary consumption. Seventy to 80 percent of estimated global livestock greenhouse gas (GHG) emissions are attributed to developing countries, where production is far less efficient. However, improvements are being made. The United Nations Food and Agriculture Organization (FAO) recently published an analysis of GHG emissions from the global dairy sector over a ten-year time period (2005 to 2015). The FAO report shows all regions have reduced GHG emissions per unit of milk, resulting in an overall emission intensity reduction of 11 percent. The largest dairy emission intensity reductions during this time period occurred in low-and-middle income nations, particularly in Africa, Asia, and Central and South America. These are often countries where the livestock sector plays a significant role in the total gross domestic product. In these regions, increases in dairy productivity are helping improve food security and climate change mitigation. In contrast, thanks to decades of advancement, the U.S. dairy sector plays a limited role in the nation’s total GHG emissions. According to the most-recent report from the U.S. Environmental Protection Agency, agriculture (animal and plant-based foods) contributes 9 percent. Animal agriculture (including dairy, beef, pork and poultry) contributes 3.9 percent. In comparison, the transportation industry and the electricity generation sector are each responsible for 28 percent of all U.S. GHG emissions—a total of 56 percent. These statistics align with other findings about the consumption of animal products and its impact on climate change. If all 320 million Americans were to follow a vegan diet, the national GHG emissions would be reduced by an estimated 2.6 percent, reducing global GHG emissions by less than a half of one percent (0.36 %). In California—the nation’s leading dairy state—the animal agriculture sector produces about 5 percent of the total GHG emissions, while the transportation sector produces 41 percent, according to the California Air Resources Board. Although dairy’s contribution to the total GHG emissions is relatively smaller than other industries, the state’s dairy farmers remain dedicated to continuous improvement. The state is actively working to reduce emissions of methane—a short-lived GHG—from the dairy sector. California is the only region in the world that has set the ambitious goal of reducing dairy manure methane emissions by 40 percent by 2030. With incentive funding from the state and guidance from ongoing research, dairy farmers are making great progress to achieve this goal. The collective efforts will also help reduce emissions from other sectors, as a growing number of dairy farms begin using dairy digesters. Digesters capture methane, which can be used to create various forms of renewable energy. While the state’s earlier digesters have created electricity, more than 58 dairy farms are now in various stages of developing projects that will create carbon-negative transportation fuel to replace the use of diesel in heavy-duty trucks. These barn-to-biogas projects are not only helping shrink dairy’s carbon footprint to unprecedented levels, they are also helping the state transition to clean energy. Another way dairy cattle contribute to the state’s sustainable food system is through use of agricultural byproducts as animal feed. Dairy cows and other ruminants can digest foods that might otherwise go to waste and, in-turn, provide nutritious foods people enjoy. About 41 percent of feed ingredients used on California dairies are agricultural byproducts, such as almond hulls, tomato pulp, cotton seed, citrus pulp, and brewer’s grain, which could otherwise be wasted. In this way, dairy farms help eliminate food waste—a significant global challenge. This works particularly well in California, where a diverse array of crops is grown throughout the seasons, and dairy farmers continually work with cow nutrition experts to make efficient use of the byproducts. Dairy farmers in California have a long history of working collaboratively with state officials and researchers to improve the protection of air and water resources, which has placed them in a strong position to lead the world in the development of climate-smart dairy. The state is implementing cutting-edge strategies and technologies, which will further improve the environment while providing nutritious and affordable foods to a growing population. While there is more that can be done here and across the globe to mitigate the effects of climate change from all industries, California’s dairy farm families are already dedicated to doing their part. Dairy Cares is a statewide coalition supporting economic and environmental sustainability and responsible animal care. Our members include Bar 20 Dairy Farms, California Cattlemen’s Association, California Dairies Inc., California Dairy Campaign, California Dairy Research Foundation, California Farm Bureau Federation, Dairy Farmers of America-Western Area, Dairy Institute of California, F & R Ag Services, GHD, Inc., Hilmar Cheese Co., Joseph Gallo Farms, Land O’Lakes, Merck Animal Health, Milk Producers Council, Ruan Transport Corp., Yosemite Farm Credit, Zenith Insurance Company, and others. For information, visit DairyCares.com or call 916-441-3318. To subscribe to the monthly enewsletter, contact dairycares@gmail.com.